For painless root canals in Marietta, Georgia, trust the professionals at Mansouri Family Dental Care & Associates. Our comprehensive, family dental practice provides a full range of restorative dental services to children and adults in Marietta and the surrounding areas. Our practice includes experienced dentists as well as a dedicated team of dental support professionals. Together we work hard to make your visits to our dental office as pleasant and as enjoyable as possible. A root canal is a restorative dental procedure used to repair and save a tooth that is badly decayed or becomes infected. 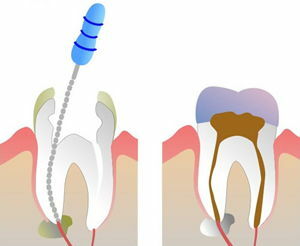 During this procedure, the nerve and pulp are removed and the inside of the tooth is cleaned and sealed. Without a root canal procedure, the tissue surrounding the decayed or infected tooth with become infected and painful abscesses may form. Both of our dentists are highly trained and experienced in performing root canals. We use this dental procedure effectively to restore the smiles of patients with diseased teeth. If you live in Acworth or the surrounding areas and are looking for a root canal dentist you can rely on, call Mansouri Family Dental Care & Associates. Our family dental practice is committed to restoring and enhancing the natural beauty of your smile using conservative, state-of-the-art dental procedures that result in beautiful, long-lasting smiles. In addition to root canals, our practice also provides a full range of preventative, general, restorative and cosmetic dental care. We can provide all the dental care you need for your entire family. For painless root canals in Marietta, contact our Marietta Root Canals Specialists at Mansouri Family Dental Care & Associates today to schedule an appointment with one of our experienced dentists. We offer local anesthesia as well as sedation dentistry to keep our patients relaxed comfortable and free of pain while receiving a root canal. Our dental practice is currently accepting new patients and we would welcome the opportunity to care for you or a member of your family. We accept most forms of dental insurance and also welcome patients without dental coverage. We thank you for allowing us to take care of your dental needs and we look forward to exceeding your expectations.